At first glance, a musical based on Charles Dickens’ A Christmas Carol makes just slightly more sense than, say, an opera of Joseph Conrad’s Heart of Darkness (Lead tenor: “Exterminate the brutes!” Chorus: “Oh, the horror, the horror”). What makes Dickens’ tale of Yuletide transformation such a perennial favorite is the subtle balance the author maintains between his trademark social-reformist concerns, and the abiding atmosphere of sentiment, nostalgia and general cheer required of holiday classics — something along the lines of what Frank Capra accomplished in It’s A Wonderful Life. Which is why the notion of turning the awakening of Ebenezer Scrooge into a piece of song and dance seems so inherently out of whack. It would appear inevitable that the results could go only one of two ways: ponderous and maudlin, like a tone-deaf Marxist singing the Communist Manifesto; or, at the opposite extreme, clumsy and pathetic, like watching a declawed cat climb a tree. So kudos to Cottage Theatre — and particularly playwright/director Keith Kessler (writing as K.K. Mills) and composer Gene Slayter — for having not only the guts to give it a shot, but for pulling it off with an unexpected degree of success. Read more after the jump! Kessler, a Cottage Grove resident, penned the first version of Marley & Scrooge in 2001; it premiered in 2004; and this current production is a revamping and updating, with additional compositions and arrangements by Brandon Rumsey, Ralph Stricker-Chapman and David Larsen. The cast is huge, and the show clocks in at a bit less than three hours. The first bit of good news, then, is that the time flies, which is no small victory for such an ambitious undertaking. The title of the musical is no lark. 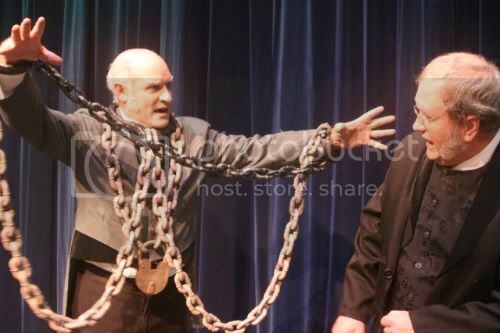 Front and center in the proceedings is Scrooge’s late business partner, the chain-bound Marley, who is played with disarming zeal by Paul von Rotz. Apart from his direct involvement in the action, Marley also doubles as the play’s narrator, observing everything and cracking wise as a sort of one-man Greek chorus. Scrooge is played by the charming and adorable (sometimes too charming and adorable) Jim Curtiss, whose natural strengths as an actor reside more in the depiction of pathos and cathartic joy than the scowling, muttering humbug of the story’s early chapter; his face is just too kind to scrunch into a believable grouch. In Kessler’s retelling, it is the titular characters who become a kind of Victorian odd couple, bound but incompatible. And because of this shift in focus, much of Dickens’ original recedes into the background, most noticeably Scrooge’s involvement with the Fezziwigs and his dealings with the family of Bob Crachit (Mike Tripp). It’s a sharp revisionist tactic, trusting the audience to fill in the passages that are foreshortened or sped over. The musical numbers — ranging from serviceable to suitable, and on the whole tastefully composed — function as character enhancements rather than advancing the narrative, which makes the production’s brisk pacing all the more remarkable. The only truly unadvisable song is “My Little Child,” Bob Crachit’s post-mortem lament for Tiny Tim (Matthew Goes), which is almost painfully over the top. Most of Marley & Scrooge’s miscues stem from the intrinsic difficulty of transplanting Dickens’ moralistic fable into a genre that is, by its nature, replete with artifice and hyped-up emotionality. When he isn’t hounding Scrooge, for instance, Marley comes across as pretty damn upbeat for a spirit damned to walk the earth; the inconsistency of his dual personalities —half howling scold, half comic emcee —occasionally weakens the underlying sense of outrage that gives Dickens’ masterpiece its edge. And yet, even if they sometimes miss the mark, Kessler and crew ultimately succeed at reworking A Christmas Carol into something pleasantly entertaining. Marley & Scrooge doesn’t pack the existential oomph of Dickens, but it’s a diverting, and respectful, tribute to the classic. 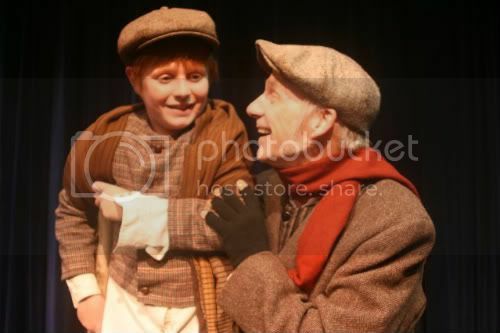 Marley & Scrooge runs through Dec. 17. Tix here or 942-8001.